This book is designed to help administrators and developers better automate Azure management tasks. No prior knowledge of PowerShell is required. This book is a one-stop guide on managing Microsoft Azure services using PowerShell. Administrators and developers will learn how to use PowerShell to create and manage Azure websites, virtual machines, SQL databases, and so on. 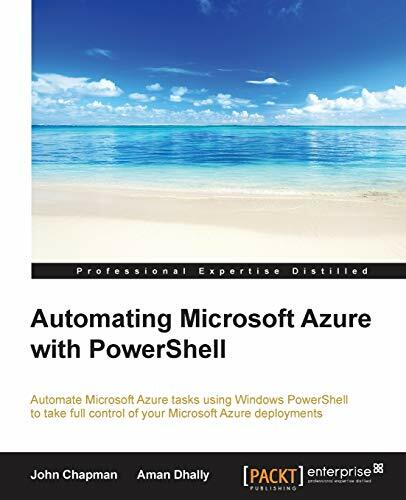 Starting with an introduction to Windows PowerShell, this book will assist you in connecting to Microsoft Azure with PowerShell. Next, the book covers how to create and manage Azure storage accounts, including file, blob, and table storage. Moving on, this book covers creating and managing Azure virtual machines, SQL databases, websites, virtual networks, traffic manager, cloud services, and Active Directory. Finally, this book covers how to automate complex tasks using Azure automation runbooks. John Chapman is a software engineer in the Phoenix area. Having also worked in the higher education, telecommunications, and enterprise software industries, John's development experience includes .NET, SharePoint, Swift, Objective-C and other languages, markup, and platforms. You can visit his website at http://www.johnchapman.net/.